I am kind of zoodled out but am doing low carb. Is there something else I can use as a noodle.? I would try a different spiralized vegetable? Can u use beef instead of steak? Can u eliminate fish sauce and coconut aminos? Can u give me the the InstaPot directions? Is the sliced steak cooked beforehand? if not how does it cook is 60 seconds? It’s very thinly sliced, cooks right in the soup. Just made this for dinner tonight, my 14 year old’s choice, and I we LOVED IT!!!! We use soy instead. Definately going to make this again real soon! OMG! I just tried doing this since I really love this kind of asian soups but always feel super guilty because of the noodles, you ara a salvation!! This soup is SO delicious! I’ve made it several times. Definitely a part of our regular recipe rotation. So good! 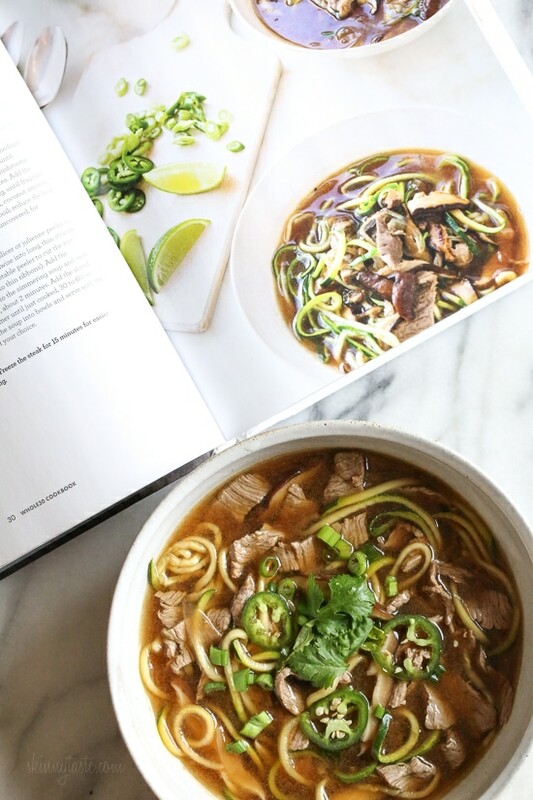 I used to have Pho all the time, and this recipe is delicious. I added a bit of hoison sauce and Sriracha to my bowl (hoison sauce upped the points, but because it’s so low in points, I was still on track). Another one to add to my rotation! Thanks, Gina! Can you tell me if I want to make this and leave it in the crockpot on warm, can I put the zoodles in the crockpot? Or would it be better to leave them on the side and let guests add them as they make a bowl? Just did not know if the zoodles would get soggy. can I use the vegetable broth instead of the bee bone? Hi, I’m home from work due to winter weather today and this was the perfect lunch. I will definitely make it again and I look forward to trying some of the variations people talked about in the comments, such as shrimp or chicken. The only thing I will do differently is to make more zoodles and to keep them set aside for leftovers so they don’t get soggy in my fridge. 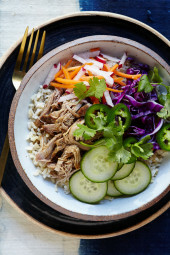 I am doing a Whole30 plan for the month of January and was pleased to come across this recipe. Thank you. Thanks for leaving your comment. I was wondering how it would do for leftovers. I will follow your lead and keep my zoodles separate from what is leftover. Hi Gina! Can I use noodles instead of zoodles? If so what do you recommend? Thanks for the great recipe, I loved how quickly/easily this comes together. 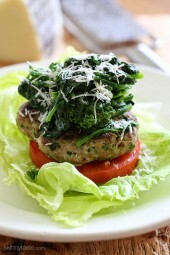 For others wanting to cook this: we don’t ‘diet’ per se, just try to eat healthy. So this recipe works and tastes great using ‘regular’ ingredients too, i.e. soy sauce and regular beef broth – we just didn’t add the extra salt. Where is the sugar coming from? Seriously the best soup I’ve ever made in my life or eaten in my life. This was bursting with flavor. Added crushed red peppers but stuck with recipe other than that. Out-freaking-standing! Hey Gina what can we substitute for the coconut oil? I’m allergic. So delicious! I’m on Day 18 of my 3rd round of Whole 30 and this was just the ticket to keep food boredom at bay! And BONUS! Leftovers! Does it stay well as left overs? So I am liking the flavor of the soup itself, but mine is a far cry from the pho I know and love. The beef flavor completely overwhelms everything else, and usually it’s all the subtle extra flavors of pho that make it special, in my mind. Too much “stuff” in it, so maybe I just made too many zoodles. I like the broth more than anything! Not sure where I went wrong. 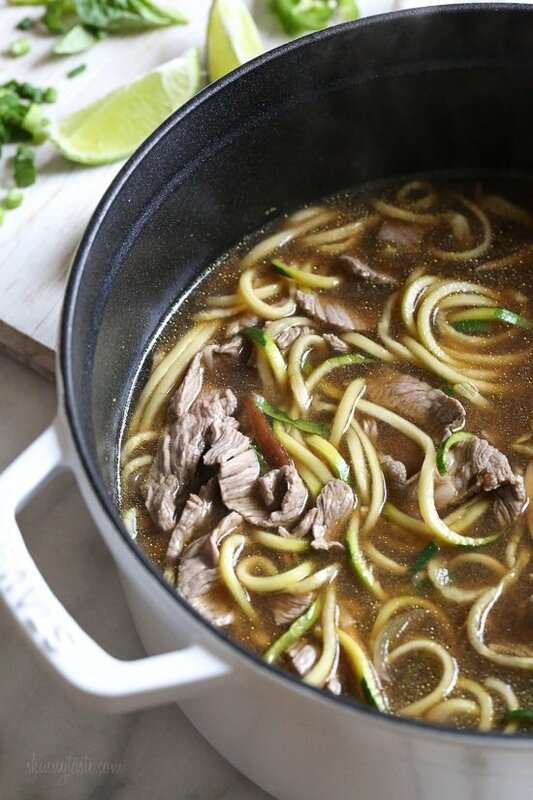 I’d probably make this again, but only as beef noodle soup, not faux pho. I just made this and it was amazing. I think it’s my new favourite meal. So good, flavours were right on! Thank you!!! Made this recipe last night and loved it! 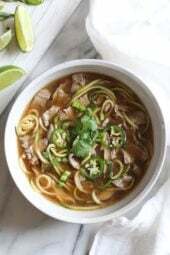 I am a huge fan of pho, so this was right up my alley, and it was so quick to make! I did add sriracha to my bowl, as I always do with pho, and that gave it a really nice kick. I might add bean sprouts in the future, and I prefer Thai basil to the basil I found in the grocery store, but it was still fine. I can’t wait to eat this again! This was absolutely wonderful … definitely a keeper! Thank you! Made it tonight… it’s fantastic! Thank you so much for the recipe! 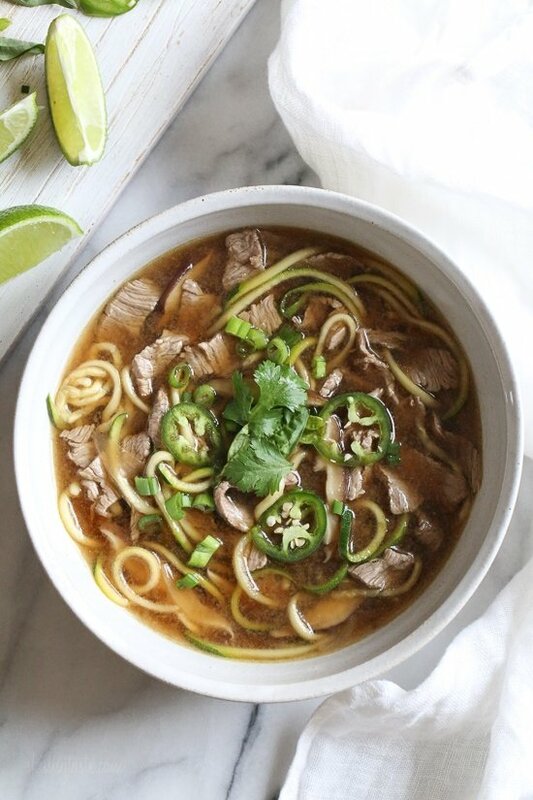 I love Pho…and this Faux Pho is AMAZING! I made my usual beef stock..from soup bones…are we calling this bone broth now?? I am not on Whole 30 so used soy sauce and olive oil otherwise stuck to recipe. Served with squirt of Sriracha …yum, yum, yum, yum, yum!!!!! I made a chicken version of this and it was delicious! Used soy sauce instead of the coconut aminos. Sliced thin chicken cutlets into slices and put in the broth before you simmer for 5 minutes. Perfectly cooked the chicken. Will definitely be making this again! Oh my goodness. This soup was so easy and so flavorful. I had done a Whole 30 in 2015 but didn’t have this cookbook. Thanks for recommending. Love your blog. I made this soup. Delicious. However, the noodles seemed to “disappear” in it. Next time I will spiralize double the amount of zucchini and yellow squash. Everything I have made is excellent, and I am keeping my “belly” relatively flat for a woman who is 67! Are all of your recipes still 1500 calories or under. Additionally, your photographs are make me want to cook everything! Thank you. I am a Weight Watcher and needed a filling yet low point dinner. This soup was just the ticket! Thanks Gina for great tasting recipes that have helped me get to my goal weight and that my husband has no idea are “Skinny”. I won’t tell if you don’t lol! Made this Pho yesterday. Got more compliments than I ever recall.. I used low sodium canned beef broth as I didn’t have Beef Bone Broth. I used vegetable oil as I didn’t have coconut oil. Did not have coconut aminos (didn’t think to look here) to find out a replacement. I do find as with other pho that I need two slices of jalapeno per serving and a lot of fresh basil and cilantro in the bowl… the longer it sits in the bowl, the better the broth gets. Thinking the next time I serve it I will add the jalapeno and cilantro and basil before serving. Would this be ok to cook ahead and freeze for future meals? This was delicious!!! Thanks, Gina! Hello- Where do you purchase the beef bone broth? Is it the same thing as low sodium beef broth. Thanks!! No, but that would work too. Any ideas what I can subsititute for the fish sauce? I’ve got a family member with a fish allergy, but I really want to make this soup! I made this for lunch today. So good! Where can I purchase beef bone broth? Or can I just sub with low-sodium organic beef broth! Thank you in advance for your time. What can we use instead of coconut amino? I don’t wish to purchase an ingredient like this that I won’t use again. Thanks. Incredibly delicious! So flavorful. I will make this often! LOVE IT, BUT CANNOT PRINT. PAGE IS BLANK. PLEASE CORRECT SO I CAN SAVE IN YOUR COOKBOOK! SOUNDS DELISH! AM ON THE WAY TO THE STORE TO BUY INGREDIENTS NOW! Could you add the Saturated Fat grams? This looks so good. Could you adapt it to a shrimp or fish meal in observance of lent? This looks really interesting! I just started another Whole30 on March 1st (and this time I got my hubby on board). I went to my doc a couple weeks ago and when the topic came to weight loss, she strongly recommended a Paleo/Primal diet, so I am trying to transition. I have only used the coconut aminos once before (in an eggroll soup) and I’m still getting used to the flavor…they are not quite soy sauce. Hi! The carbs seem high in this recipe with no noodles. Is it due to the coconut aminos? Is the measurement for soy sauce (instead of coconut aminos) the same? This looks divine! Thanks. Love soup. Going to replace the beef with shrimp maybe use a different broth as well! Can’t wait! I don’t like Fish Sauce….so it’s not something I would buy. Is there a substitute for this or would you suggest I omit it altogether? Thank you! The recipe looks delicious. me too– What can I sub for Fish Sauce? 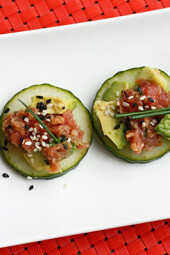 Your updates to my mailbox keep me inspired to cook simple yet delicious meals most days. This looks like a great recipe that I would like to try, but the print button doesn’t seem to be working and hauling my laptop into the kitchen to follow the recipe is a bit cumbersome. Can that be fixed? Wouldn’t print for me either. I made a change to the code, see if it works now. The print button is working for me now that you’ve made the change. Thank you! I love pho! This sounds amazing! Is there a sub for the coconut aminos? Coconut aminos and liquid aminos are very different things actually. Coconut aminos contain no soy, while liquid aminos are a highly processed form of soy sauce that relies on chemical reactions instead of natural fermentation. This recipe looks delish! Definitely bookmarking it to try later! They are like liquid aminos which is a soy sauce substitute. I buy Dr. Bragg’s Liquid Aminos. This looks awesome! My husband hates mushrooms, so can you suggest an alternative vegetable? Thank you! Bean sprouts, bell pepper or more onions would be great. This looks delicious, can’t wait to try. What exactly are coconut aminos? I found them online, but I am wondering what exactly they add to the soup and how else they can be used? Coconut amigos are used as a soy free and vegan alternative to soy sauce. Faux pho. Faux pho. Faux pho. Fun to say, and looks delicious!! I think this is the recipe that will finally convince me to get a better spiralizer.